Since 1961, the UU Early Education Cooperative (UUEEC) preschool has provided a quality education program to Valley children and their families. "Last summer, it looked like our congregation was planning to shut down our 55 year old cooperative preschool. 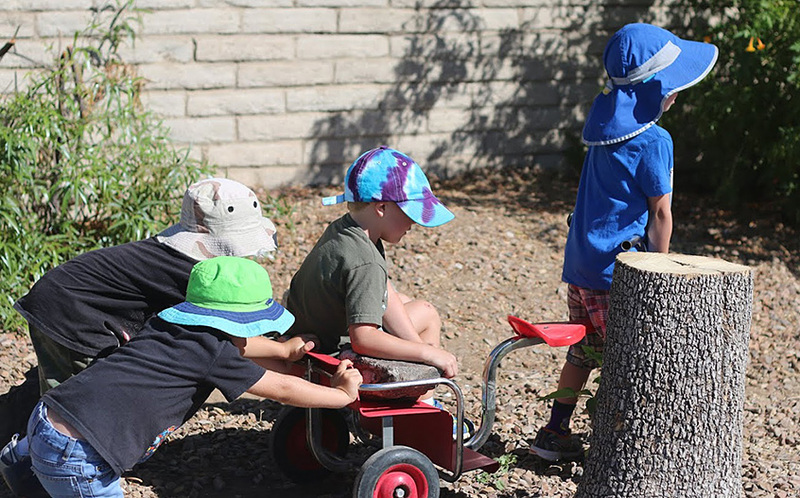 As one of the first nationally accredited preschools in the State of Arizona, this local educational landmark had parents and staff who went on to be leaders in early childhood education across the country. When the church admitted it was just taking too much time to administer the program, dozens of current and former preschool parents rose to the challenge and decided to form a new non-profit organization to keep the preschool operating for another 55 years." "5pm came to the rescue! Just as summer was starting and our parent group was scattering, 5pm was used as a virtual chat room to keep track of a variety of projects to keep them on time and on budget. We established a new organization, incorporated, filed for non-profit status, established a board with by-laws and operating agreements, established a transition committee, and monitored a rumor mill to keep all the volunteers on track. All comments were logged, all information was shared and organized, making us a formidable organization in no time with one clear voice and all of the 10 board members on the same page as we shared our transition intentions. We did most of this virtually, while folks were on vacation or teaching at summer camps or catching a chance to check up on the new organization after the wee preschoolers were asleep. Almost all of our main meetings and conversations were logged with members of the board even voting virtually. 5pm kept our new non-profit on track, and through organization, it saved our preschool! We could come to agreements about legal language in 24 hours, without long phone calls, and in a way that decisions and opinions were clear and considered. 5pm kept our new non-profit on track, and through organization, it saved our preschool! Now we’re in a one year transition, and our most active projects are fundraising, governance, and finance (pulling together a multi-year budget). Thanks 5pm, we couldn’t have done it without you!"